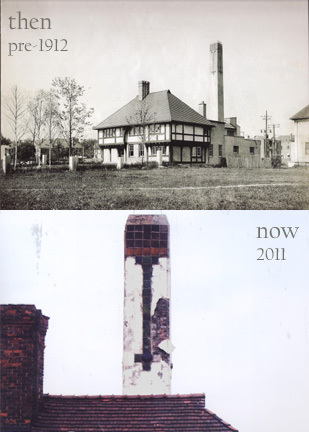 For over 104 years, the iconic 49-foot tall chimney in the heart of the Pewabic Pottery has stood the test of time, but now it needs your help. According to experts who traversed both the outside and inside of the chimney to document the damage, as soon as this October, and before our Michigan winter sets in, the outside shell of the chimney must be repaired. Pewabic Pottery was founded in 1903 by Mary Chase Perry (later Mary Chase Perry Stratton) and her partner, Horace Caulkins (developer of the Revelation Kiln), at the height of the Arts & Crafts movement in America. Pewabic’s first home was a stable on Alfred Street in Detroit. Four years later, Pewabic Pottery moved to a new facility on East Jefferson designed by architect William Buck Stratton in the Tudor Revival style. In 1991, the building (which still houses the Pottery) and its contents were designated a National Historic Landmark and today is Michigan’s only historic pottery. Under the direction of Mary Chase Perry Stratton, Pewabic Pottery produced nationally renowned vessels, tiles, and architectural ornamentation for public and private installations and later, when the Depression reduced the demand for costlier wares, ceramic jewelry featuring Pewabic’s unique iridescent glazes. Works fabricated by Pewabic Pottery can be seen throughout the United States in such places as the National Shrine of the Immaculate Conception in Washington, D.C., the Nebraska State Capitol, the Science Building at Rice University in Houston, and the Herald Square installation commissioned by the New York Metro Transit Authority. Stratton is a member of the Michigan’s Women Hall of Fame. Continue to read more about the history of Pewabic by clicking here. The total cost of restoration for the Save Our Chimney Drive is $125,000. We need big and small donations to pay for this most necessary repair. No donation is too small. Click here to DONATE NOW or download our Pledge Form to make a donation. As pewabic is a 501(c)(3) non-profit, all donations are tax-deductible. As more donations are received, we will fill in more tiles on our virtual chimney. Check back often to see how your generosity is helping! Let’s not let another piece of history fall victim to the wrecking ball. Even if it’s just a little please take the time and donate to help save the chimney! This entry was posted in Detroit, Things To Do and tagged 1912, 2011, chimney drive, detroit, Michigan, pewabic, pewabic pottery. Bookmark the permalink.